Learn how to make Grandma Baker’s Egg Noodles. This easy egg noodles recipe uses four simple ingredients: eggs, flour, milk and salt. When my husband was a little boy, every year for Thanksgiving, Christmas and any other family get-together, his dad would load up the car and they would head to Grandpa and Grandma Baker’s. Grandma Baker always made a huge pot of homemade egg noodles and my husband always looked forward to eating them. 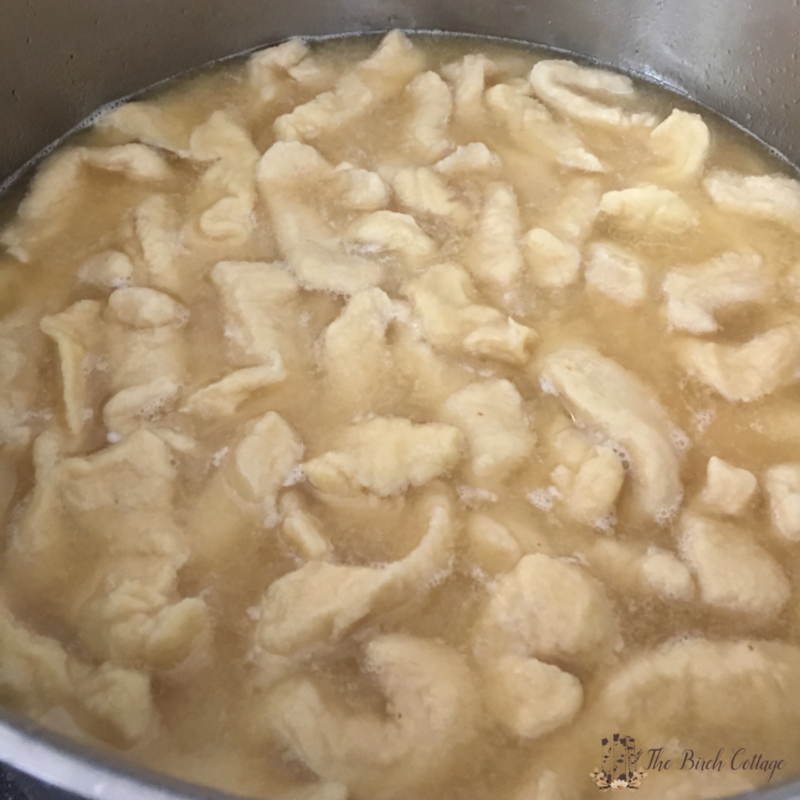 Grandma Baker’s egg noodles recipe isn’t so much about the ingredients used to make the noodles, but rather they way she made them and the fond childhood memories that were created right along this family heirloom recipe. What makes Grandma Baker’s egg noodles so special? I think that what made Grandma Baker’s egg noodles so special is not only the way she made these very thick and hearty noodles, but all the love that went into every batch she made. 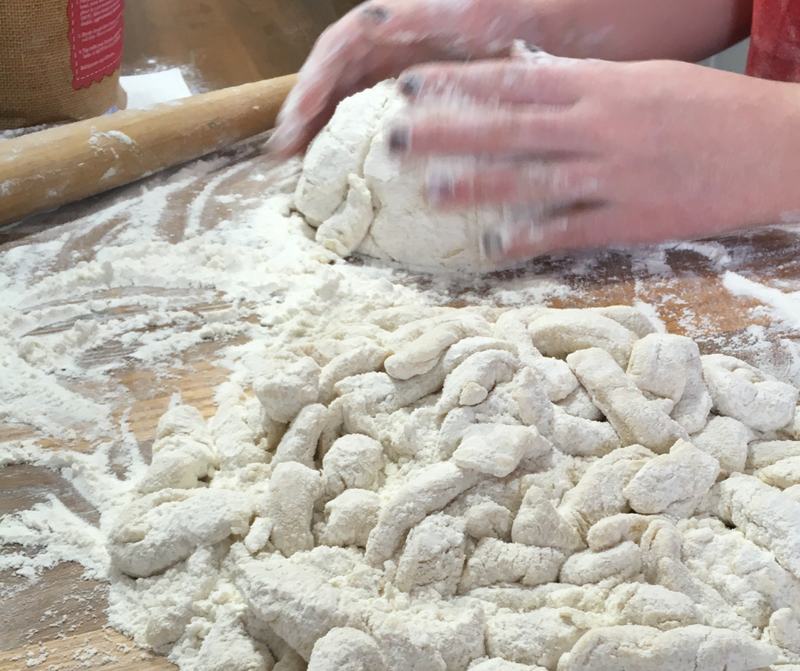 I can’t even begin to tell you the number of conversations and memories that even our children have that are centered around “Grandma Baker’s egg noodles”. Homemade noodles are also a part of my fond childhood memories. But, the noodles I grew up eating are nothing like these! Truth be told, I love my noodles. But everyone that has ever had Grandma Baker’s egg noodles, loves them even more. For the past 10 or more years, my husband has been making Grandma’s noodles. He takes great pride in carrying on a family tradition and passing that tradition on to our children. He’s actually groomed Morgan and Kristen (pictured above) on the fine art of noodle making. Of course, Grandma’s Egg Noodles, would be the same as everyone else’s if it wasn’t for the turkey stock. My husband literally roasts two whole turkeys. He slow roasts or smokes (our new favorite) the turkeys, cuts off the meat and then makes turkey stock out of everything else. The flavor from the smoked turkey is absolutely amazing and over the top. It just adds such depth to the turkey and noodles. 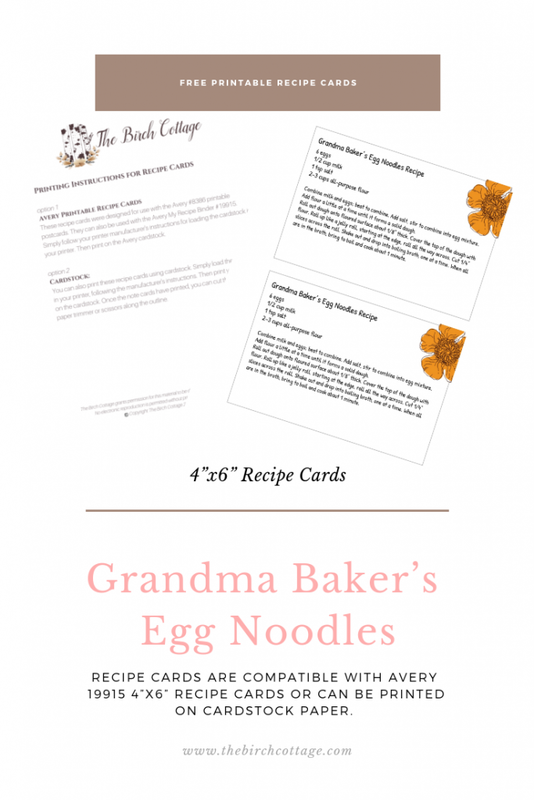 But, today, I just want to share Grandma Baker’s Egg Noodles Recipe with you. At some point, I’ll write out all the instructions for creating this amazing stock. There are just four simple ingredients in the egg noodles: eggs, milk, salt and flour. Grandma made her dough kinda thick, as you’ll note in the recipe. An heirloom family recipe handed down from generation to generation. Egg noodles are easy to make and require only four simple ingredients. Combine milk and eggs, beat to combine. Add salt and stir to incorporate into egg mixture. 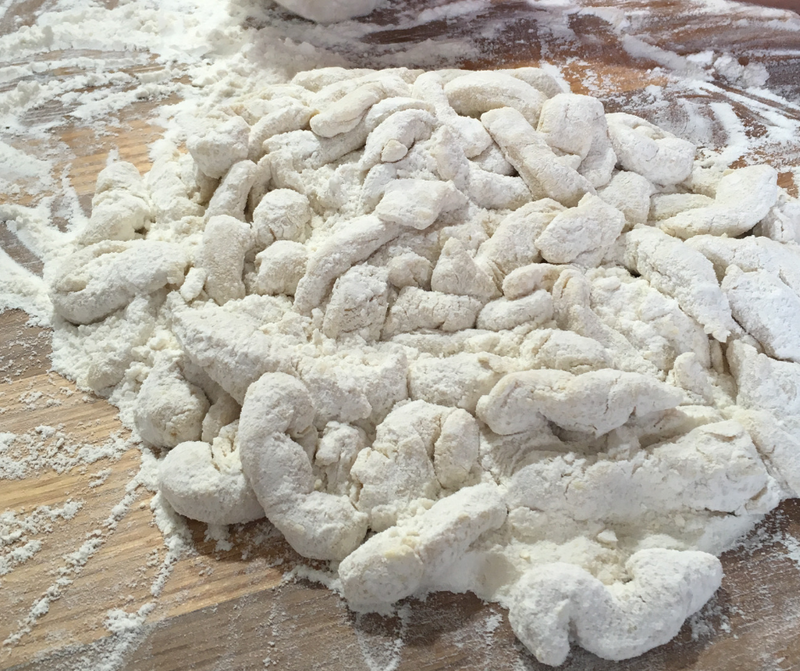 Add flour a little at a time until it forms a solid dough. 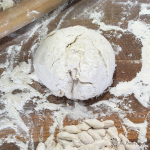 Roll out dough onto floured surface about 1/8″ thick. Cover the top of the dough with flour. Roll up like a jelly roll, starting at the edge, roll all the way across. Cut 1/4 inch slices across the roll. Shake out and drop into boiling broth, one at a time. When all are in the broth, bring to boil and cook about 1 minute. When my husband makes noodles for our family, he usually makes two or three batches. Did I mention we have a large family? Plus, he likes to make sure there’s plenty leftover so everyone can take some home – just like Grandma Baker used to do. 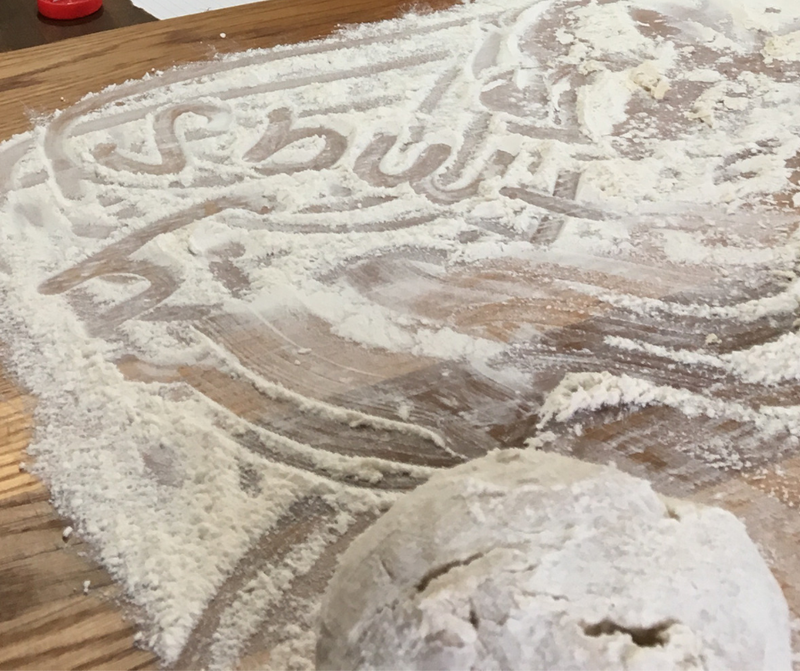 I wonder if Grandma Baker ever wrote messages in her flour? I think it used to say “Merry Christmas”. 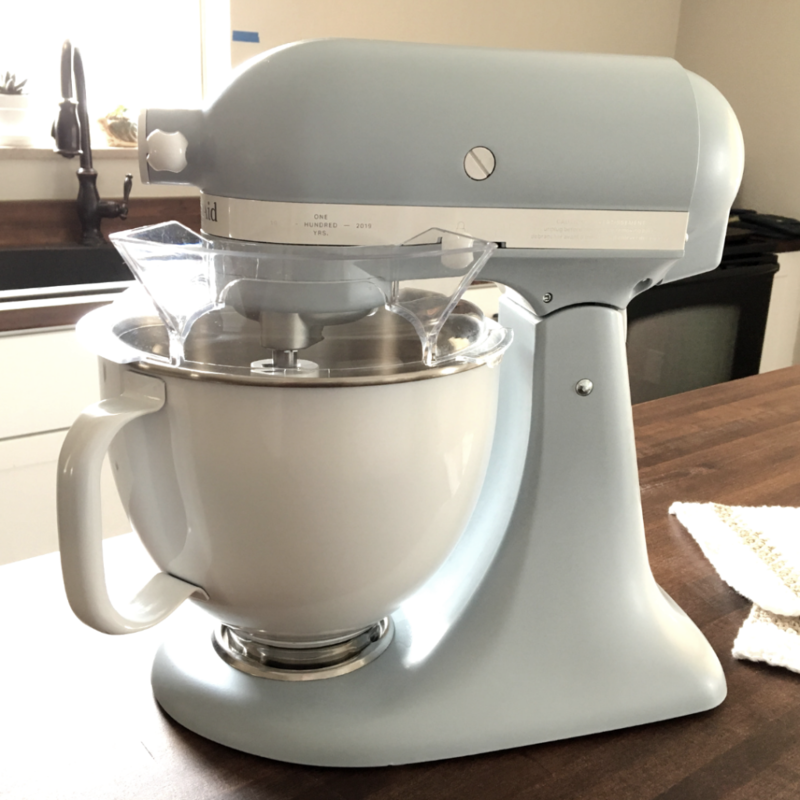 Helpful Hint: Use a Stand Mixer! Disclosure: This blog post contains affiliate links for products or services I think you’ll like. This means if you make a purchase from one of these links, The Birch Cottage will make a small commission at no additional cost to you. All opinions expressed are 100% my own. I gotta tell you though, the use of the KitchenAid Stand Mixer with the dough hook attachment has certainly made noodle making a lot easier! 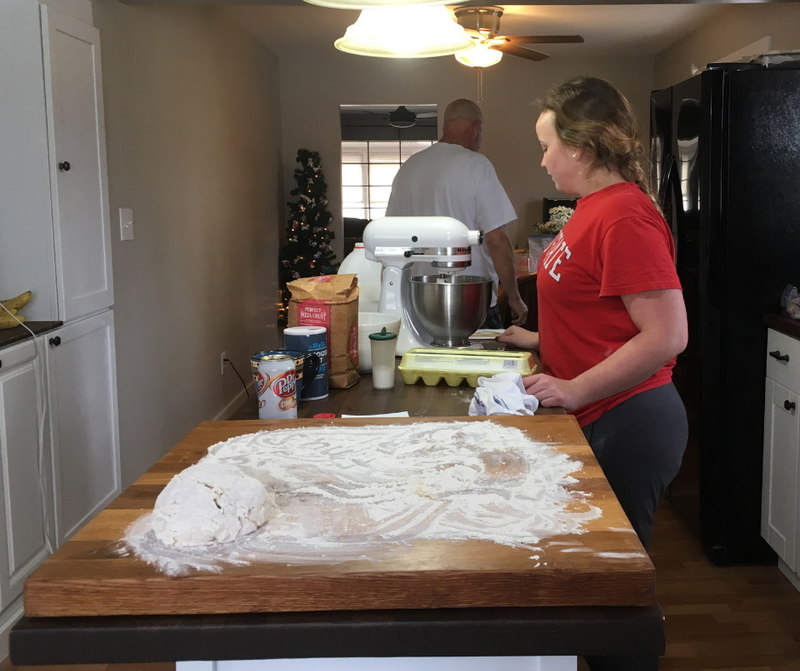 We didn’t have Misty Blue last year when my husband and daughter were busy making egg noodles for Christmas dinner, but we were able to borrow our daughter Morgan’s stand mixer. Morgan actually has the stand mixer that belonged to Nanny, my husband’s mother. In fact, this past year, Lenny even taught Morgan how to make Grandma Baker’s Egg Noodles. Eventually, we can turn the whole noodle making process over to the girls and we can just sit back and enjoy the dinner! Except, somebody needs to learn how to smoke the turkey! We have found that the best and easiest way to cut noodles is by using a pizza cutter. It makes cutting dough a breeze and the dough doesn’t stick to the blade. 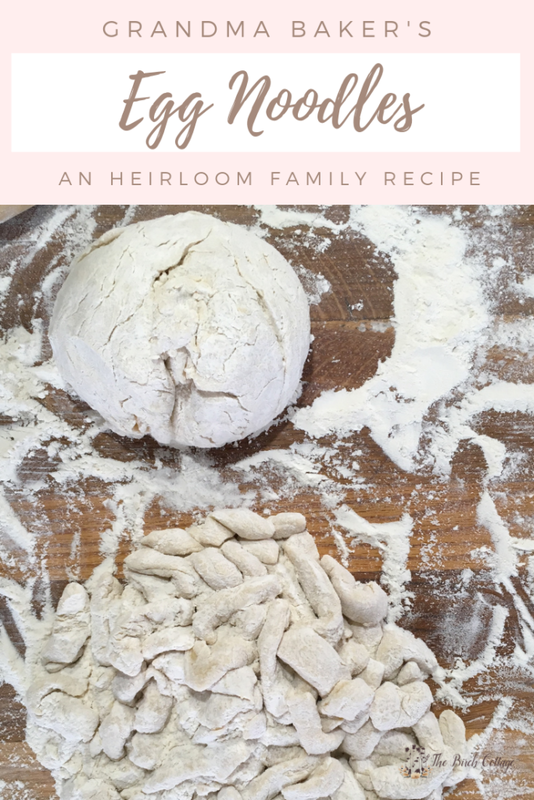 Do you have a favorite family heirloom recipe that’s been passed down from one generation to the next? As far as I know, Grandma Baker’s Egg Noodles Recipe has been passed down through 4 generations (5 counting her). That’s pretty amazing! 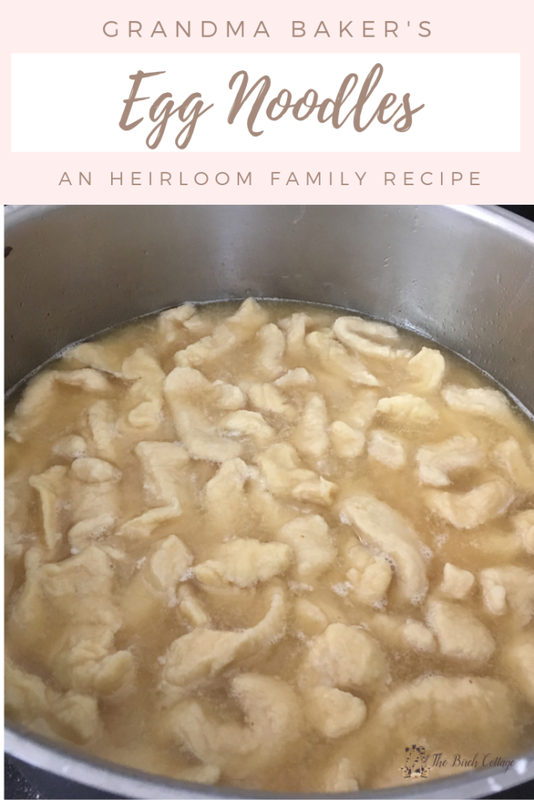 I couldn’t share such a cherished recipe with you without providing a free printable recipe card. I know you can print the recipe directly from this web page, but there’s just something extra special about recipe cards. Once you’ve confirmed your e-mail address, we’ll send you a confirmation email with a link to the entire Subscribers Resource Library, where you’ll have access to this free printable and so much more! The Library is stocked with free printables and other content that is EXCLUSIVE for subscribers. Plus you’ll have the opportunity to get fresh ideas from The Birch Cottage newsletter. Do you have a favorite family recipe that’s been passed down for generations? I’d love to hear about it! Just leave me a comment below.